Welcome to the weekend! What are your plans? At the moment, @TheWelshWookie and I are chilling out, watching rugby (OK, I’m watching and blogging- gotta love multi tasking!) and drinking coffee. It’s bliss! Today’s Hal Higdon training plan called for a 6 mile run. It’s Week 3, Day 6 already. How did that happen? 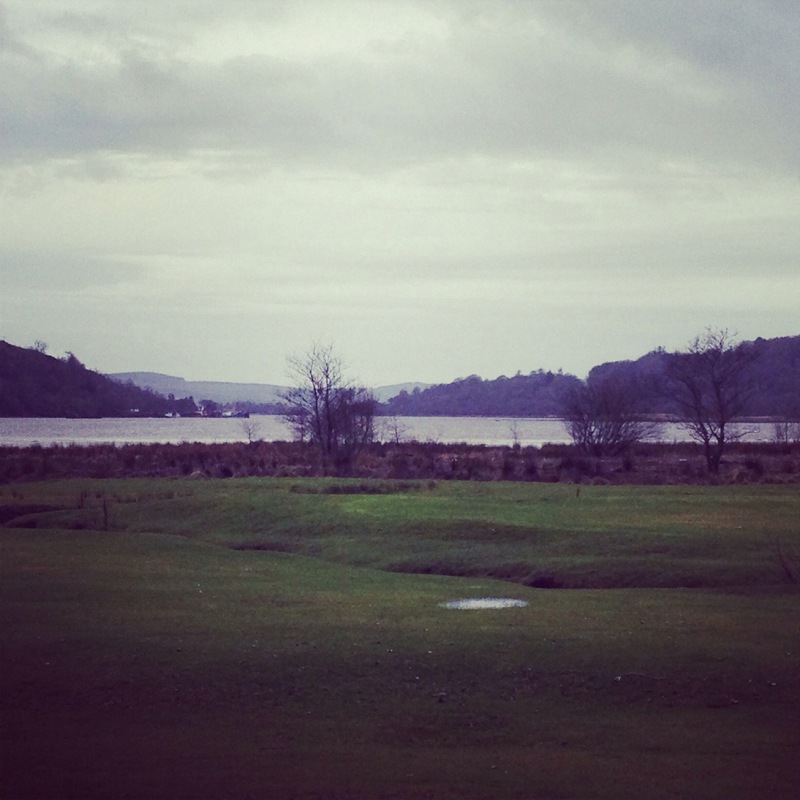 @TheWookie and I had decided last night that we’d run the Big Glen: a loop that takes us out from the north of the village along the main road for about two miles, and then follows a single track road for a mile before reaching West Loch Tarbert. It then leads back into the south of the village, and is about 5 miles long. To increase the mileage, we decided to run along the Kilberry Road, past the village golf course, before heading back into the village. 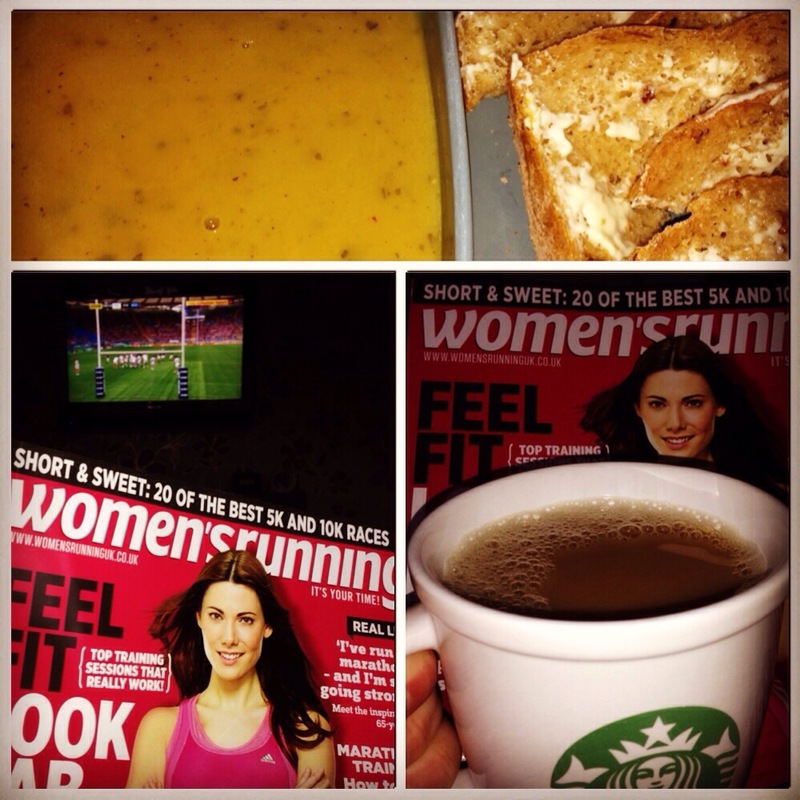 We’ve refuelled on some soup and home made bread; and I have the new edition of Women’s Running to enjoy! Have a great weekend, all. How long is your long run this weekend? How’s the weather looking? Ohh I’m jealous of your outside run!! I’m hoping this warm streak we’re having (if you can call it much) will melt the feet of snow built up in our yard, driveway, streets, EVERYWHERE so I can get back out there SOON! Great run! I’m sure it felt wonderful running outside after running on the treadmill for a while!! That’s awesome! I ran 13 miles today and the weather was perfect!! So glad it’s done and was successful!!! 🙂 Have a great weekend!! Well done you, that’s brilliant! You’ve earned your weekend! My Saturday afternoon is also coffee and blogging. Now it’s carb time to fuel up for my run tomorrow then my running magazines await to read in the bath tomorrow night. Lovely! Enjoy, you’ll have earned it- especially if the weather forecast is right! Welcome back to the outside world! Once the wind dies down I think we are approaching spring! I think we might just be! I didn’t run today. We had snow this morning and now we have rain. Tomorrow I have an 8k race but a run for me. It will be hilly but good to be out. 14 people so far for the relay. Glad you had a good run and could get outside. SO much better when you can run outside. Enjoy your run today: the numbers are going up! It got cancelled because we have snow today. I will get out though and do something. I see a walk on the agenda today. Working on the map now and trying to figure it all out over java. Ha ha! Nothing beats running outdoors! Stick to the plan, Higdon’s da man! We’ve had great weather this weekend so I decided to test my knee on a run. Joy! It was a little stiff, but I was able to run just fine! Going to yoga today, so we’ll see how it goes! The No Rain Miracle…love it. What a great place to run. My long run was 15 miles with a mile walk cool down. Your running route sounds wonderful. Thank you, I’m really lucky!